What is it about Arizona that attracts so many of these visitors each and every year? Is it because of the diverse climate? Is it because of the year round weather that allows golfers to play virtually every day? Is it because of the Grand Canyon, Sedona, Tucson, the White Mountains, the city life of Phoenix or Scottsdale that attracts so many people from other cities and countries? It may be hard to answer this question with just one simple reason. The fact is this,depending on just who you ask, you might very well get a different answer. All the mentioned reasons why people experience Arizona tourism are true. Size may also have something to do with the popularity of AZ tourism, as well. Arizona ranks sixth among the states in size and is spread out over 114,006 square miles, (295,274 square kilometers), which includes 364 square miles, (943 square kilometers) of water, giving both visitors as well as residents plenty of room to roam! Arizona's dimensions total 392 miles, (or 631 km from north to south) and 341 miles, (549 kilometers) from east to west. This might also explain why so many visitors are more likely to stick around a little longer after a couple of Arizona vacations once they realize just how many Arizona attractions actually exist. During the hot summer months, while many Arizonans head further west to California, just as many, if not more, travel to the northern elevations such as Sedona, the Grand Canyon or the White Mountains where the weather is typically 15-20 degrees cooler. As mentioned, AZ tourism is really popular all-year round with its diverse climate. Every year in the late summer to early fall, Arizona sees the snowbirds trickle in as the cooler air from other parts of the country convince them to flock to the Arizona desert until spring time when it warms up enough for them to return. We also see a great number of Canadians who escape the brutal cold! 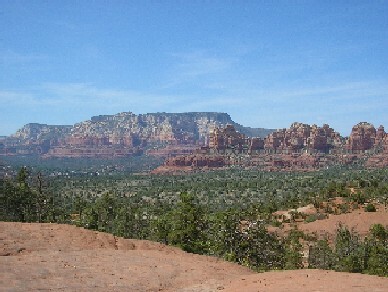 Arizona tourism is also popular because of all of the 1-Day activities and other attractions, such as hiking. Arizona's mean elevation is about 4,100 feet, or 1,250 meters. Contrary to what maybe some believe, Arizona is not a flat state with no color or Wildlife! There are plenty of mountains to hike on with elevations that will astound you and a list of wildlife that will likely make you want to discover all the desert wildlife that the Sonoran desert has to offer you. Arizona tourism allows everyone to explore the diverse landscapes that can be found throughout the state. Arizona travel also includes the magical (and mysterious, to some) red rocks and even snow-capped mountains. Wondering where to stay? Compare hundreds of hotels on one site to find the deal that's right for you! Arizonan truly has it all. Whatever your interests or skill levels are, there's an endless list of activities that involve AZ tourism! Whether it's the money generated from the reenactments from an Old-West gun fight, horse back riding tours, or from one of the many dinner theaters or even the local grocery stores, the office of Arizona tourism appreciates everyone that travel and live here in Arizona. Many of the AZ lodging sites include the convenience of having a pick-up and drop-off point right at your hotel. Whether you are traveling to Sedona, Flagstaff, the Grand Canyon or some other popular city within the state, many of the tourist companies will cheerfully pick you up at your hotel and drive you back following the completion of your tour. Jeep-tours, fly fishing, white-water rafting, hiking, golfing, skydiving, boating, museums, spas, Native-American culture, Arizona Diamondback, Phoenix Suns, Phoenix Coyotes, Arizona Cardinals, horseback riding, hot-air ballooning, desert museums, water skiing picking wild strawberries, shopping malls, fine dining along with entertainment such as outdoor jazz concerts, and so much more. Find the best deal, compare prices, and read what other travelers have to say at TripAdvisor golf, spa, Jeep, flight tours, rodeos, and best yet, relaxation and sun! Why Go Any Further When The Desert Southwest Of Arizona Has It All?